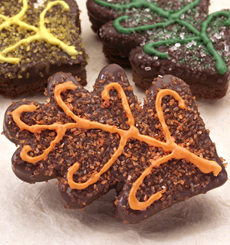 These beautiful brownies look like autumn leaves. From Simply Divine Brownies’ Silhouette series. KAREN HOCHMAN is Editorial Director of THE NIBBLE. This was a tough assignment—but good for the milk industry. CAPSULE REPORT: These are among the most charmingly-decorated brownies we’ve come across—hand-cut in shapes for every holiday, or decorated in squares to make any day seem like a holiday. A mother and daughter in Maine are making brownies that they call Simply Divine. Every day, they bake them to order, mixing up flour, eggs, dark brown sugar, unsalted butter, unsweetened and semisweet chocolate and vanilla. They whip up batches of brownies, which they then decorate in the most charming ways, as you can see on this page. We think they are simply divinely designed—we’ve never seen a line of brownies quite so attractive. The taste profile is an unusual one: brownies themselves are dark and chocolatey; the frostings are very sweet. 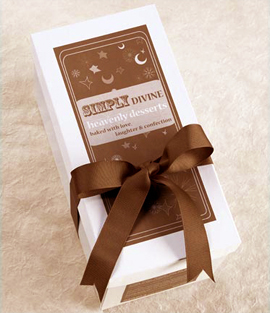 As a result, we think Simply Divine Brownies will delight the younger folk—who will remember them for years to come—and those somewhat older folk who have a very sweet tooth. Simply Divine’s Silhouette brownies are cut from a brownie base with cookie cutters, then dipped in fine chocolate, frosted with a hard, boiled icing and festively decorated, and hand decorated for your celebration. Brownies make party favors and place holders for Halloween, Thanksgiving and all occasions to come. Autumn Acorn Brownie: Iced in chocolate and brushed with exquisite edible gold luster, the brownies are individually wrapped in a cellophane bag and tied with a ribbon. 5.1 ounces each. 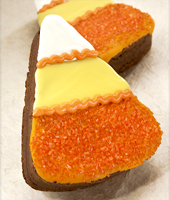 Candy Corn Brownie: Iced in yellow-and orange-infused white chocolate and sprinkled with orange sanding sugar, they are wrapped in a cellophane bag tied with a string of jack-o-lanterns. 5.4 ounces each. 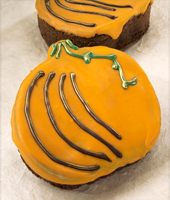 Pumpkin Brownie: Iced with orange-infused chocolate, brushed with food luster and decorated with a twisted icing vine. Wrapped in a cellophane bag and tied with an autumn ribbon. 6 ounces each. There’s also a ghost brownie and a spectacular black cat. If you don’t see it on the website, call. Silhouette brownies are special orders, so it may take three or four days to be scheduled and baked. Please allow at least a week’s lead time when placing your order. 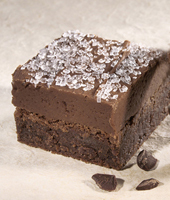 Cocoa’s IncrEdible Creations: Try a chocolate brownie with a thick milk frosting, topped with jewel-like sparkling sanding sugar. 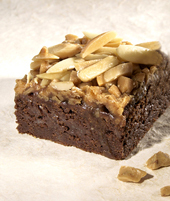 Crunch Time: Chunks of caramel in the brownie base with a topping of butter-toasted almonds and butter brickle. 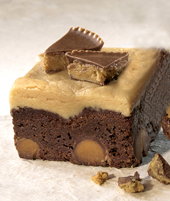 Love Affair: A relationship that truly will last forever, this brownie is topped with peanut butter frosting and peanut butter cup pieces, with PB morsels tucked into the brownie. Need’him: Several flavor favorites combine in this one: coconut-filled Needham frosting is sealed with a dark chocolate glaze. 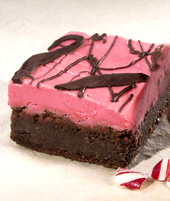 Peppermint Peace: Pink buttercream frosting is swirled with pieces peppermint sticks and drizzled with dark chocolate. 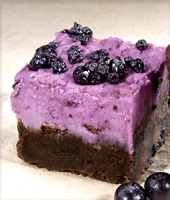 Singin’ The Blues: Double antioxidants, chocolate brownie with blueberry buttercream frosting. Flavored brownies are smaller than Silhouette brownies. Brownies are between 2.3 and 4.4 ounces each. There’s a specialty feature flavor each month, which you can order as part of the Star Sampler. Flavors include such unusual brownie flavors such as apple pie, chocolate-covered raisin sweet potato cheesecake and whoopie pie. Send a box to your favorite princess. No fairy godmother (or father) could send a better gift. 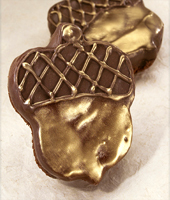 Purchase online at SimplyDivineBrownies.com or telephone 1.888.327.6964. 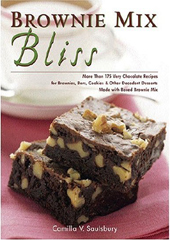 Brownie Mix Bliss, by Camilla V. Saulsbury. Nobody would ever be able to guess that all of the scrumptious treats in this book started with a humble box of basic brownie mix. Mocha Buttercream and Mint Julep Ganache Brownies are just steps away with this easy-to-use cookbook! Click here for more information or to purchase. 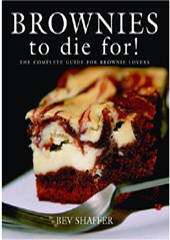 Brownies to Die For!, by Bev Shaffer. Award-winning chef and food columnist Bev Shaffer presents over 100 of the most fabulous brownie recipes, from the traditional to the decadent. Specializing in creating uncomplicated recipes and calming food phobias, Shaffer includes her usual measure of tips, techniques, and encouragement with each tablespoon of chocolate. Click here for more information or to purchase. 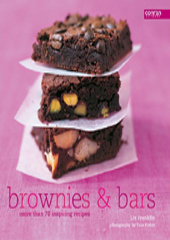 Brownies & Bars: More Than 70 Inspiring Recipes, by Liz Frankin. Indulge in moist, rich brownies and delicious dessert bars with this collection of recipes that is a must-have for anyone with a sweet tooth! 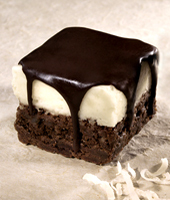 Whether you crave a classic fudge brownie or a jam filled coconut bar, Brownies & Bars will have you baking up a storm. Click here for more information or to purchase.